For all the tasks in between the regular vacuum of the house, a handheld unit might be just the tool you’re looking for. 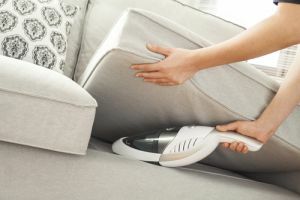 It’s ideal for when you have a small mess to clean up or pet hair on the couch to vacuum up, and don’t want to lug your large barrel unit around. But before we get into the brands, let’s see exactly what a handheld vacuum is designed for and how much they cost. A cordless handheld vacuum is a compact and portable version of a regular vacuum. It’s ideal for high surfaces such as shelves, curtains, window frames, picture frames, lampshades and door ledges. It can also help with vacuuming drawers and under the bed. It’s usually capable of cleaning all types of debris including dirt, dust, pet hair and everyday spillages. As it runs on a battery, you shouldn’t expect the same vacuuming power with cheaper models as you would with standard corded vacuums. In addition, you are probably unlikely to vacuum a whole house with this small unit. How much do handheld vacuum cleaners cost? Typically, handheld vacuum cleaners cost between $30 and $250. Some of the pricier units in our list are 2-in-1 models, which incorporate a cordless stick vacuum with a detachable handheld unit, so that you can clean up the small messes, plus all other areas of your home. If you already have a regular vacuum then it might not be worth spending more on a 2-in-1 model as there are plenty of individual handheld units available. Dyson is well-known in the world of vacuum cleaners and has earned quite a reputation in regards to innovation. 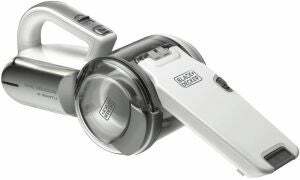 Its V6 Trigger handheld unit is designed with Dyson’s V6 Digital motor and 2 Tier Radial cyclones for suction power. The motor is stated to drive stiff nylon bristles into carpet pile to help remove hair and dirt from the hard to reach areas such as inside the car or stairs. It’s boasted to fit naturally into the shape of a hand with its ergonomic design, plus its centre of gravity is located at the grip, making it quite easy to handle. 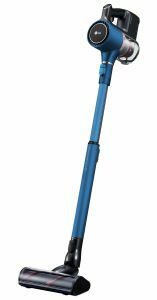 It comes with a motorised brush bar, specifically designed for pet hair and ground-in dirt. It also has a combination tool and crevice tool for in between couches. It offers 20-minutes of run time and 17 minutes when using the motorised tool. For extra problematic areas, the boost mode offers 6 minutes of increased suction power and to recharge, it takes 3.5 hour, according to Dyson. Black & Decker has one of the largest ranges of handheld vacuums, including this 18V Dustbuster Pivot hand vacuum (PV1820L-XE). Its patented nozzle design is stated to pivot up to 200°, helping you access awkward spaces from different angles. The flip out soft brush is created for delicate surfaces, whilst the integrated extendable crevice allows users to vacuum between sofa cushions and car seats with ease, according to the brand. The design allows you to folds the whole unit in half for compact storage and charging. It comes with a crevice tool, charging base and an integrated soft brush, plus it has a 440ml dustbowl capacity. The 18V lithium-ion battery provides up to 10 minutes of suction power, whilst the Eco Smart charger is said to take four hours to charge the battery from empty. The charge indicator light flashes 30 seconds before the battery runs out. Electrolux is a big name in the world of appliances. Whether it’s fridges, dishwashers or vacuum cleaners, there’s certainly plenty of choice in the Electrolux line up. The Rapido is a handheld vacuum cleaner from Electrolux ideal for the quick clean-ups of unexpected dry spills. This new generation unit is equipped with added features including the pull-out nozzle which extends cleaning reach slightly and felt-covered nozzle wheels stated to help avoid scratching delicate surfaces. The handle is said to have also been improved on grip for better handling of the vacuum. Additionally, the charging stand is wall-mountable and can be adjusted to five different positions for easy storage. Its 18V lithium ion battery is claimed to provide up to 33 minutes of run time in boost mode. It also allows you to continually clean for up to 16 minutes in regular mode and takes four hours to recharge. 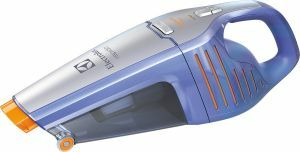 There are three models of handheld vacuums that Hoover offers at the time of writing, including this 18V Pets Plus Handivac. It features the standard bagless design with portability in mind. It’s aimed to remove pet hair and dirt from hard floors, tiles, carpet, stairs and furniture. It comes with a charging base as well as a number of attachments. These include a crevice tool and extension tubes for those hard-to-reach areas, plus a soft brush for delicate dusting tasks, such as window sills and shelves. According to the troubleshooting guide, this model is said to run for about 8 to 12 minutes with a minimum recharge time of 6 to 8 hours. What can you not find in Kmart nowadays? This portable handheld vacuum from Kmart is the cheapest unit compared to the other brands mentioned in this guide. It’s boasted to keep your surroundings clean and hygienic with ease and works for both wet and dry mess. Similar to all Kmart appliances, this rechargeable vacuum has been tested to applicable electrical safety standards and has been certified as compliant. Other durability and performance testing have also been carried out. Its compact design lets you dive into tight areas and is stated to run for up to 15 minutes when fully charged. According to the instruction manual, the unit should be charged for 12 hours initially and then regular charging is stated to take 8 hours. LG is on par with the current appliance trend that is steering towards stick vacuums, which also turn into handheld units for smaller cleaning tasks. If you’re after a 2-in-1 model, then this A9 handstick vacuum cleaner from LG might be one to consider. It has a five-step filtration system boasted to remove dust particles as small as 2.5 microns in size. The metal filter, cloth pre-filter and fine dust filter can all be removed and washed. Tools featured with this model include a Multi-Surface Power Drive Nozzle and a Hard Floor Power Drive Nozzle, plus combination and crevice tools. The telescopic pipe can be adjusted to four different lengths from 880mm to 1120mm for added versatility and the Opti-balanced Handle is designed to help reduce muscle discomfort while vacuuming, according to LG. The A9 is claimed to operate for up to 40 minutes (without the Power Drive Nozzle), however, this time decreases with different settings and attachments. You can purchase additional batteries to increase its run time. It has a 0.44L dust bin capacity, which is standard across most vacuums of this size. Target has one model that is part of the 2-in-1 stick and handheld vacuum category. The TSVAC100 model is boasted to be simple to use, plus has a lightweight and compact design for convenient storage. It’s aimed to clean dust, dirt and pet hair and comes with a quick to empty compartment that’s easy to clean and maintain, according to Target. Its main features include a long reach, flexible steering and can lie flat for storing it out of sight such as under the bed for example. It’s recommended to clean its filter regularly to ensure the vacuum runs to its full capacity. The TSVAC100 model is rechargeable and runs on a 12V battery. UK brand Vax specialises in all things flooring – from steam mops to vacuums. The Vax Cordless VII vacuum is designed for carpets and hard floors, boasted to maintain powerful cleaning results, from start to finish, even if the battery is running low. It features a detachable handheld vacuum for daily vacuuming with washable filters. While it has a lightweight design for ease of manoeuvrability, it’s one of the heavier models within this line up. It comes with a dusting and crevice floor tool for other vacuuming tasks including shelves and window sills. This VX67 model offers up to 35 minutes of run time with its 18V battery. It’s stated to take five hours to charge, plus has 0.4 litres of dust bin capacity. This Vax model can also be found in Target. Other details that you may also like to keep in mind include charge time. Most of the units mentioned in this guide are stated to take around four hours to fully re-charge, which is a fairly long time considering you might only be able to use it for 15 or so minutes. 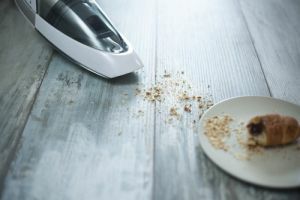 However, bear in mind that handheld vacuums are designed to be easy to grab and use for those small accidental spills that don’t require a regular vacuum. 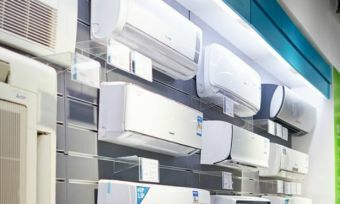 Your budget might also be a factor and while most units sit under $200, it’s still a hefty price to pay for a small appliance. Nevertheless, if convenience is of importance to you, then a handheld vacuum might be just what you’re after. It would be wise to do your research before jumping into a purchase decision and while you’re here, our vacuum ratings provide a guide as to which brands are best-rated in Australia. Hit the link below to find out.